After an extension of the original 48 hour long ceasefire in Zabadani and al-Fu’ah, negotiations between the SAA and opposition forces failed and the ceasefire collapsed. SAA, Hezbollah, NDF, and PLA clash with islamist opposition and local fighters in Zabadani. 2 Hezbollah fighters killed during the clashes. Opposition and JAN forces shell al-Fu’ah and Kafarya. An SAA brigadier-general was killed along with 4 others driving with him in his car in Damascus yesterday. It remains unknown who carried out this attack. 14 civilian casualties reported today during ongoing SAA bombardment in east Damascus countryside including the towns of Duma, Irbin, and Harasta. Clashes between SAA and opposition forces in al-Moadamyeh. 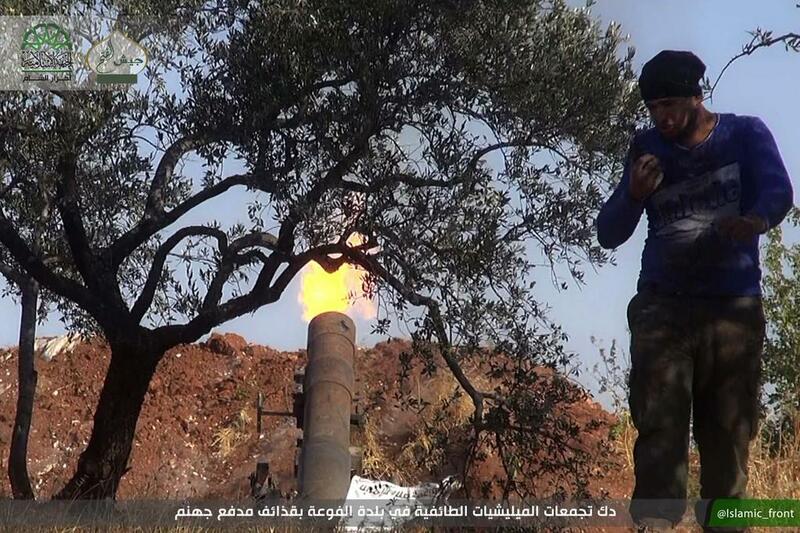 Opposition faction Ahrar al-Sham fire artillery shells on al-Fu’ah. Image courtesy of @Ahrar_lens. The ceasefire in Zabadani, al-Fu’ah, and Kafarya has come to an end as SAA shell Zabadani and reports of more than 200 shells dropped by opposition and JAN forces on al-Fu’ah and Kafarya. Clashes between SAA and opposition in western Damascus countryside. Reports of casualties on both sides. Islamist opposition fighter killed after an IS IED explosion in Yalda. Unknown fighters attacked a fuel truck on the road between Damascus and Homs (M5) setting it on fire. SAA and IS clash in areas west of Palmyra. 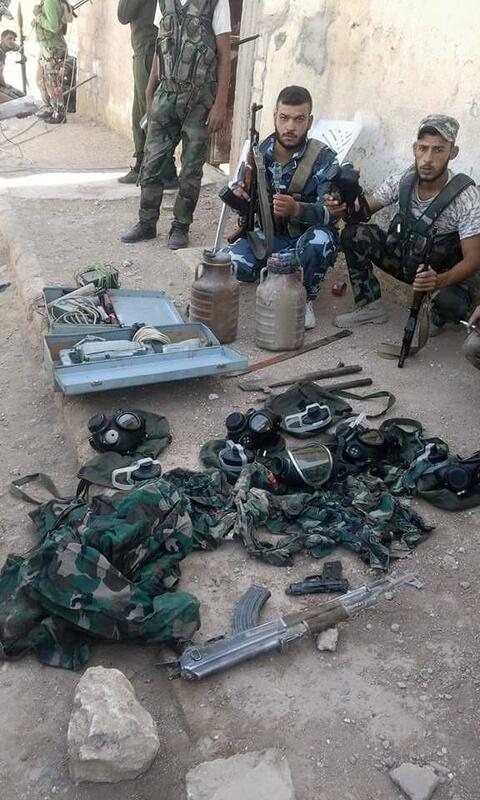 IS equipment found in a tunnel under Ghawiran Cemetery. Image courtesy of @Ibra_joudeh. 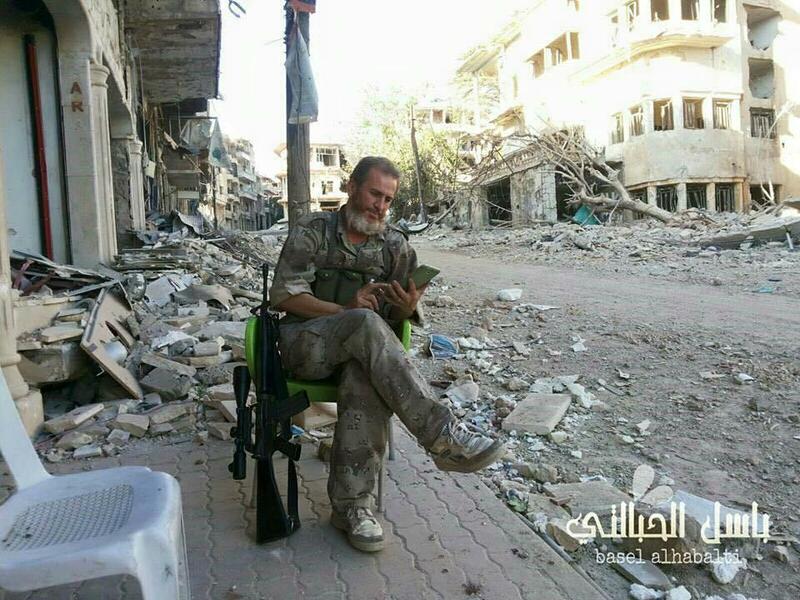 An opposition fighter in Zabadani during the ceasefire. Image courtesy of @SyriaDirect. A ceasefire between the SAA and opposition forces in Zabadani, al-Fu’ah, and Kafarya has come into effect 6 AM this morning and will be in effect for 48 hours. The ceasefire does not include Madaya, the village just south of Zabadani, as reported yesterday. Clashes between opposition forces and the SAA in Duma break out. IS and opposition forces clash in eastern Qalamoun. IS forces manage to advance in the area along with reports of casualties on both sides. IS clash with opposition forces in Yalda, south Damascus countryside. Reports of casualties on the opposition side. 26 SAA casualties including a captain during the last three days of clashes with opposition forces atop Nabi Younis Summit. 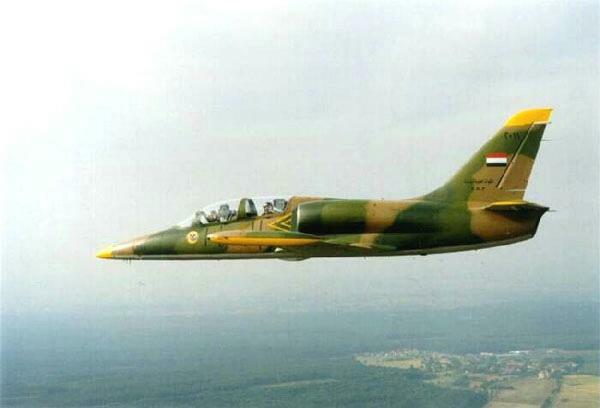 SyAF L-39 crashed in Kuweyres Military Airport. Image courtesy of @murasel_harbi. A Syrian Air Force jet (possibly an L-39) crashed in Kuweyres Military Airport. Whether the crash was due to a technical issue or IS fire is yet unknown. The team piloting the jet has yet to be found. SAA detonate a tunnel in Karram al-Jabal Neighborhood, northeast Aleppo, killing some opposition forces in the area. The explosion was soon followed by clashes between the SAA and opposition. Fights break out between SAA and opposition in Bustan al-Qasr Neighborhood, near the center of Aleppo. SAA and NDF clash against opposition forces in Salaheddine Neighborhood, southwest Aleppo. SAA, NDF, and Hezbollah fight against opposition forces in Karram al-Tarrab Neighborhood, east Aleppo. Ahrar ash-Sham, one of the factions joining the offense against the SAA in Bashkuy, making their way towards the village. Image courtesy of @Ahrar_lens. Local fighters loyal to IS kidnap approximately 20 Kurdish citizens in a village near Sarrin. JAN and opposition forces launch a large-scale attack against SAA in Bashkuy and neighboring areas thus managing to take control of some locations near Bashkuy suffering only two casualties one of which was a media correspondent. Since the 16th of August, 247 casualties were recorded after consecutive bombardment of villages and cities in eastern Damascus countryside. Approximately 1000 were injured. 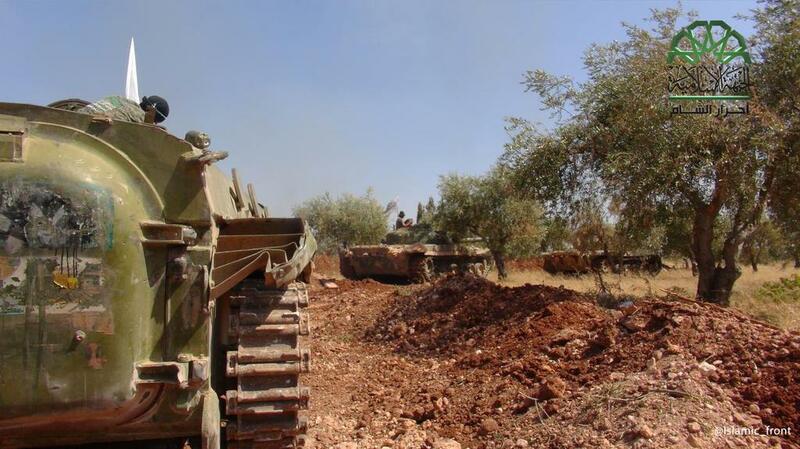 Clashes break out between SAA and opposition forces in Madaya, south of Zabadani. Heavy SAA bombardment on the villages in east Damascus countryside including Duma, Hamoryah, Saqba, and more causes the death of 31 civilians and injures many more during the last 24 hours. SAA have been bombarding these areas intermittently for the last few weeks. Opposition forces execute a heavy barrage of rockets and mortars targeting numerous locations in the capitol. more than 20 civilians injured. Clashes between SAA and opposition forces renew in Darayya. 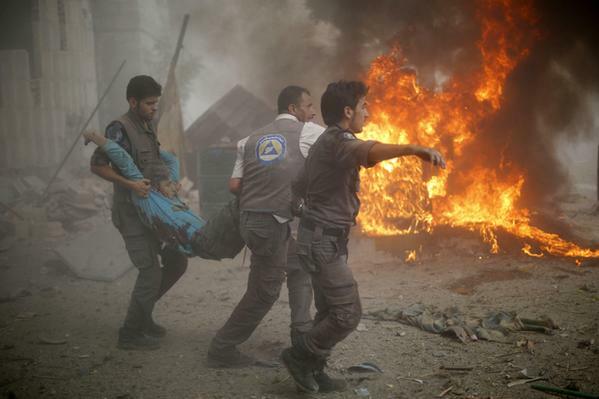 Rescue teams carry a civilian out of areas hit by SAA bombardment in Duma. Image courtesy of @MiddleEastEye. The city of Duma is target to heavy SAA bombardment once more, causing 20 civilian casualties and at least 200 injuries. A video was released showing 8 IS fighters’ heads cut off of their bodies by SAA soldiers in Kuweyres Military Airport after an IS suicide VBIED attack and fighting between the two factions yesterday killed 9 SAA officers. Approximately 50 IS rockets were launched on the village of Marea yesterday, some of these rockets contained harmful chemical substances. Clashes break out between SAA and opposition forces in al-Shihan area. Reports of casualties on both sides. SAA and opposition forces renew their fighting in al-Khaledia Neighborhood, northwest Aleppo. 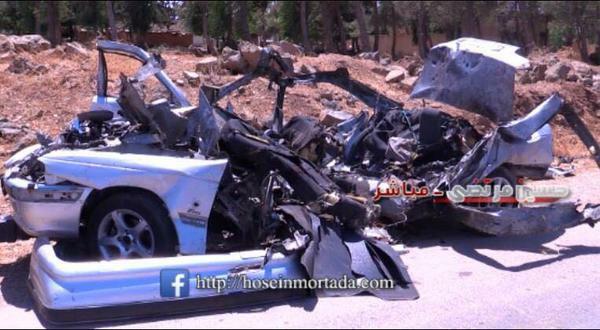 5 NDF killed by Israeli airstrikes while driving this car near al-Kawm. Image courtesy of http://hoseinmortada.com.